I wasn't planning to post anything during the holidays but I am so excited about my sale bargains, I had to share. Normally I don't get involved with the Christmas sale because most often it is already "over" (as in all the good stuff is gone) when I come back from my Christmas holidays, however, this time I had my eye on a few certain things and really made an effort of getting them. I started my sale shopping on Boxing Day on the French Sole website where the best styles usually sell within days and I managed to find a beautfully sparkly Henrietta and a quilted brown Simple ballerina which will hopefully arrive in the post soon. 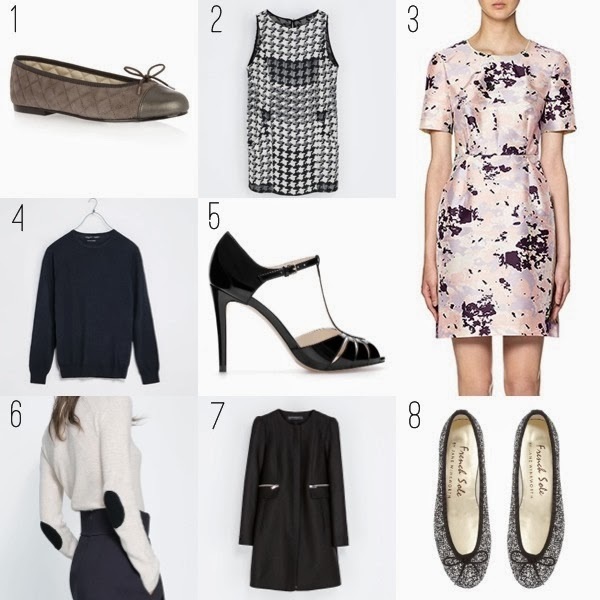 The day after boxing day I went into town at my parents' and managed to get the Zara coat (#7), dress (#2) and shoes (#5) I was after, plus 2 cute jumpers. My third day of sale shopping was all about the Whistles Terrazzo Print Structured dress (#3) which I fell in love with in the summer when I saw it at John Lewis, however, at £165 it was way out of my price league. It went into the sale shortly before Christmas at £80 but due to Xmas gifts, I had no shopping budget left for myself. Unfortunately it is now sold out online but I asked Joe nicely if he would check the Whistles store near us and not only did they have the dress in the right size, it was also marked down by another £30 making it an even 50. I am so excited, I cannot wait to get home now! It will be the perfect dress for a couple of weddings I am going to in the summer. So all in all I have done really well and I plan on getting a couple of statement necklaces from Accessorize, too, once I am back on Tuesday. I hope you have had a fabulous Christmas and will be celebrating the new year with friends and family!